Hi All! I guess everyone is getting back into their normal routine with the kids back in school. Mine are grown so I stay in my routine year-round. Which is go to work come home and work. Work Work Work! Do you feel that way too? For my fun I create things, and makeover things like this vintage train case that I picked up at a vintage shop a few weeks back. 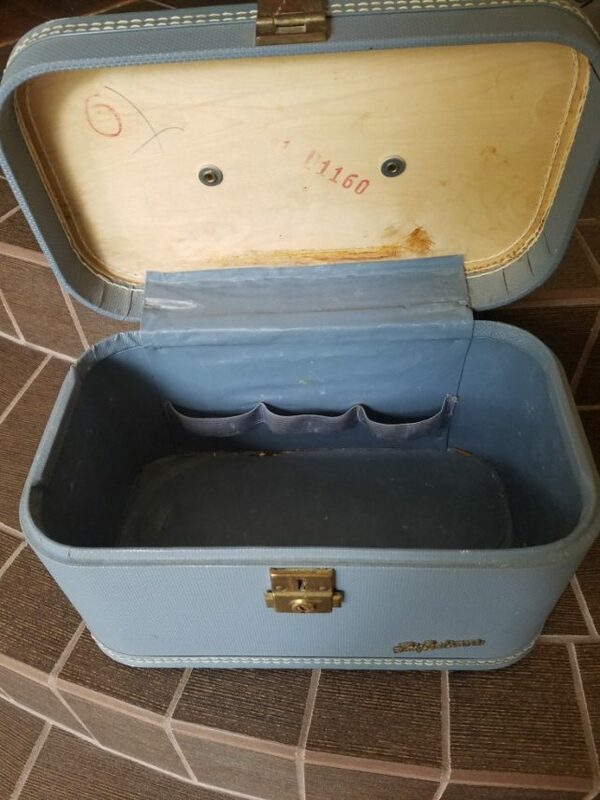 I have been wanting a vintage train case for sometime, but not willing to pay the high price for one. I found this one when the hubby and I were out thrifty. This one dates back to the 1950’s. I paid $10 for it, little more than I wanted (Hey I’m cheap) but since I was going to redo it, and keep it for myself I went ahead and purchased the case. Can you believe I didn’t even know the name for one of these vintages cases was a train case? I grew up referring to it as a toiletry case or just a small suitcase. To start out I wiped the case down inside and out with vinegar and water. Then I chose the color Celery from my small chalk paint stash for the outside of the case. It took two coats, I also painted the inside edges of the case above the liner. Then I went shopping at one of my favorite stores Hobby Lobby to find the perfect material for the inside of my vintage train case makeover. This is the fabric, and cord that I chose. 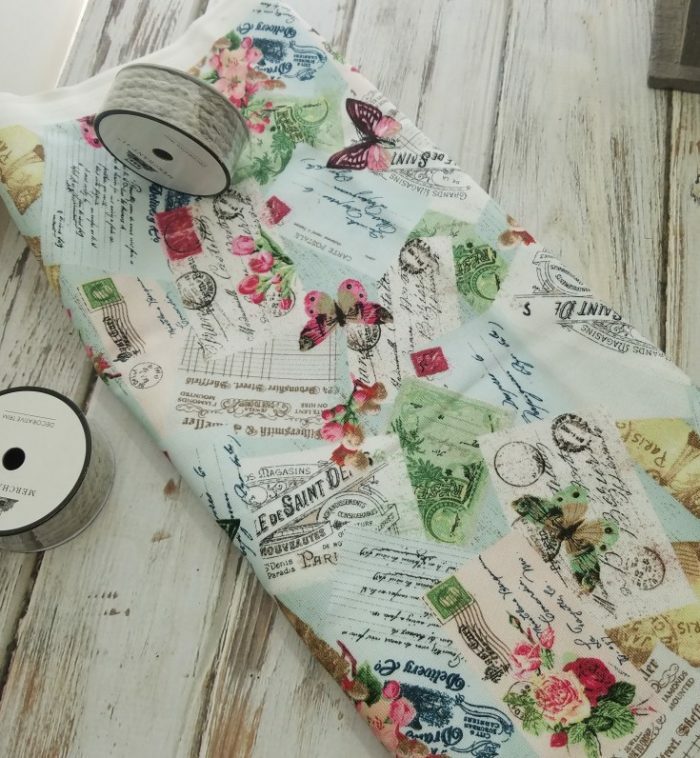 Don’t you think this fabric is the perfect choice for a traveling train case? Finding the cord to go around the top, and bottom seams was a little more difficult to find. They didn’t have anything to match, so I bought this with the thought of just painting it. But after getting it home I think it will be just find as is. Excited to get started I made my pattern for the bottom, top, and side pieces for the inside liner of my case. Then cut them out of my fabric. Next came adding the cord around the top edges of the fabric, and around the bottom seam where the fabric meets. I used hot glue for adding the cord. I did the same around the top lip of the case as well. This next step I debated whether to leave the fabric as is or to add a coat of Mod Podge over it. The Mod Podge won out. I figured the extra coat would protect the fabric, and make it easier to clean if something was to spill on the inside. Now back to the outside, it needs something else. At first, I was going to cut out some of the post card patterns that’s on the fabric that I used for the inside. Then decoupage it to the outside, but decided against that idea. Hmmm, what to do? Back to the craft store with buying a vintage rubber postal stamp in mind. I thought that would be cute since this is a travel case. Yay! I was in luck they had just what I was looking for. 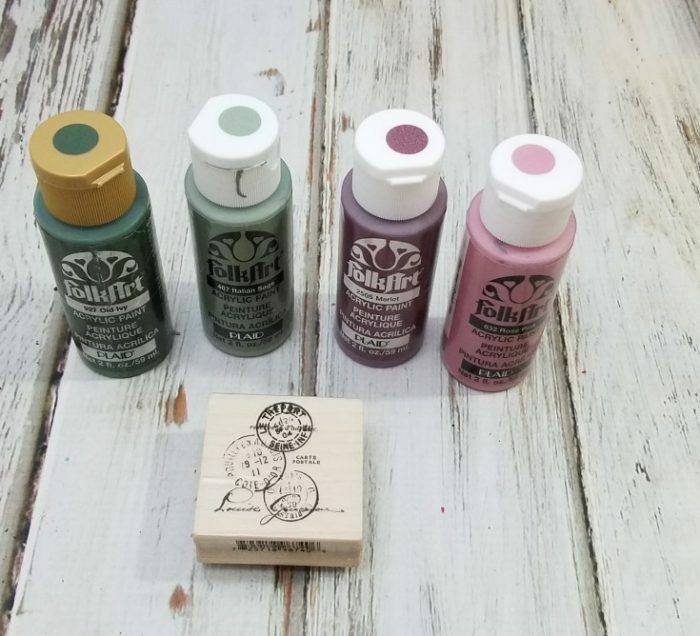 Next, I gathered up some of my acrylic paints in different shades of mauve’s and green’s. Adding a few drops of each color on a paper plate I then started stamping the pattern onto my traveler’s case here and there changing the colors, and turning the stamp different ways. Once I thought that I had stamped enough of the postal pattern onto my case I still had a few spots that could use a little something. So, digging through my small stash of rubber stamps that I had on hand I came up with a small heart. 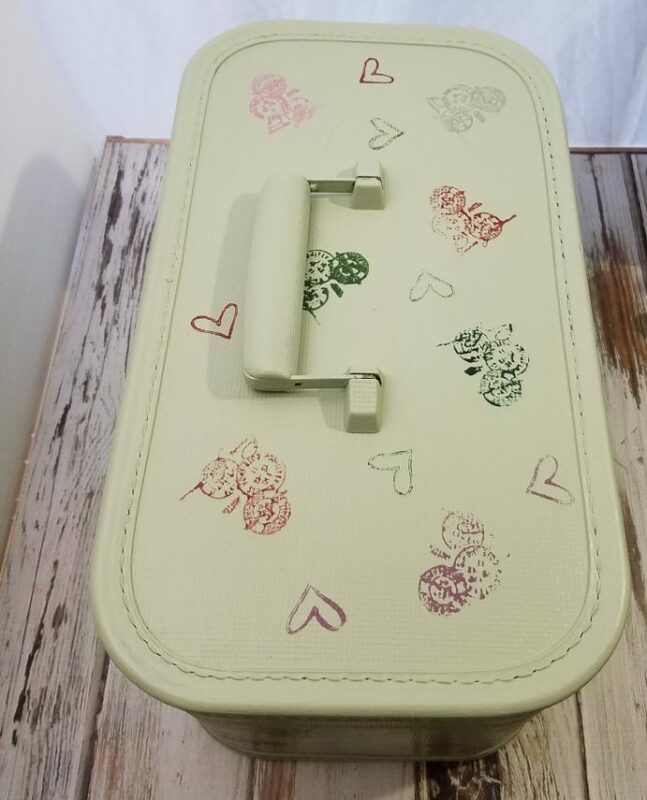 How to make over a small vintage suitcase. Train case. This little heart would be the perfect addition. A heart for the love of travel! 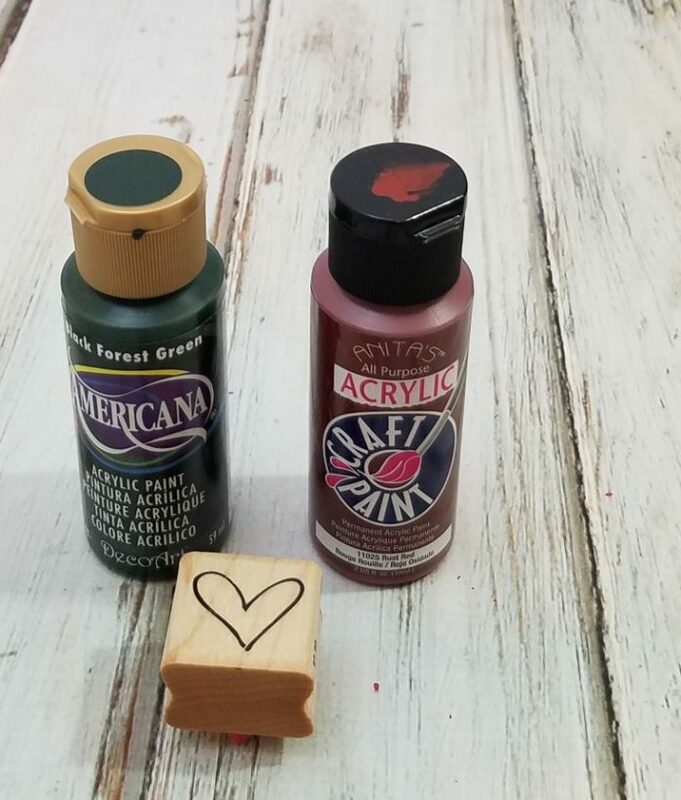 I brought out a couple more colors for adding the heart. Black forest green, and rust red. 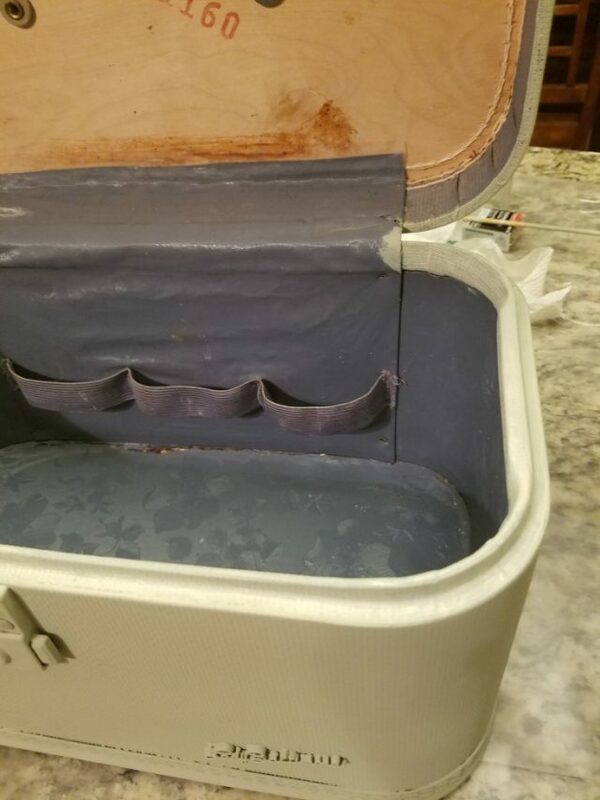 I let this dry for a couple hours then I added two coats of Mod Podge over the entire outside of the train case. Letting each coat dry thoroughly. This will help to protect my paint job and stamping. Because of painting the edges of the case, it tends to stick now. So, to fix this problem I rubbed some olive oil to the edges so that it will open easily. 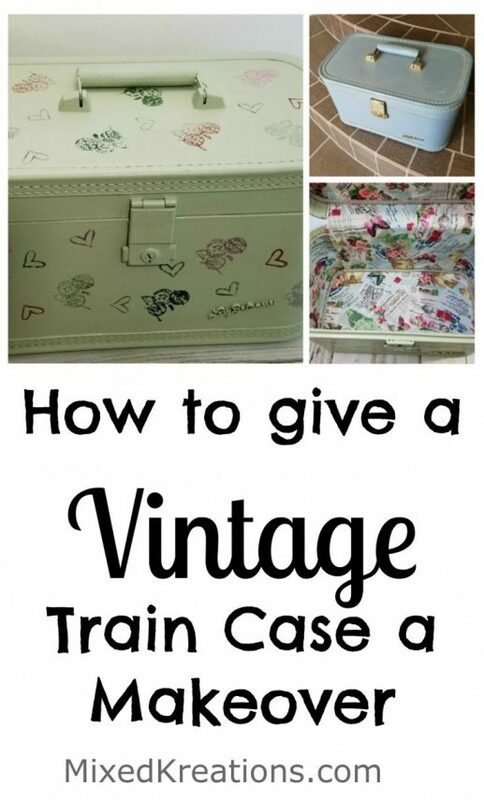 All done with my vintage train case makeover, and I am so LOVING how it turned out. 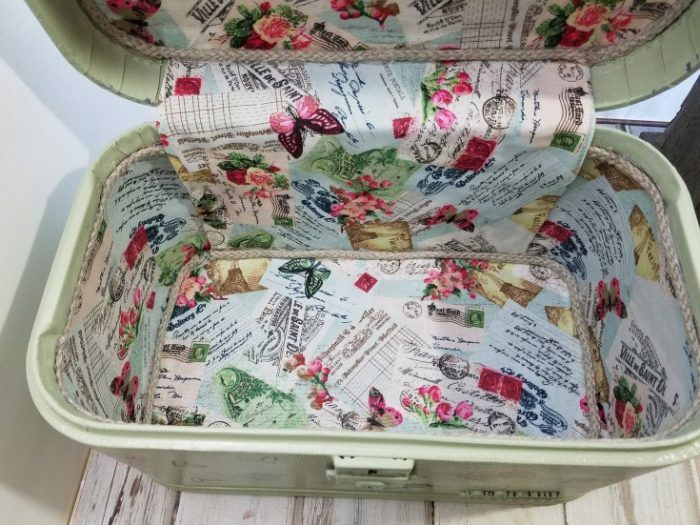 Have you ever made over a vintage suitcase? If so I would love to heard about your makeover. Linda I had no idea these were called train cases. My daughter has one and we just thought it was a cosmetics case. I LOVE what you did with it. The fabric inside with the piping is such a nice and unexpected surprise. Beautiful choice of fabric. 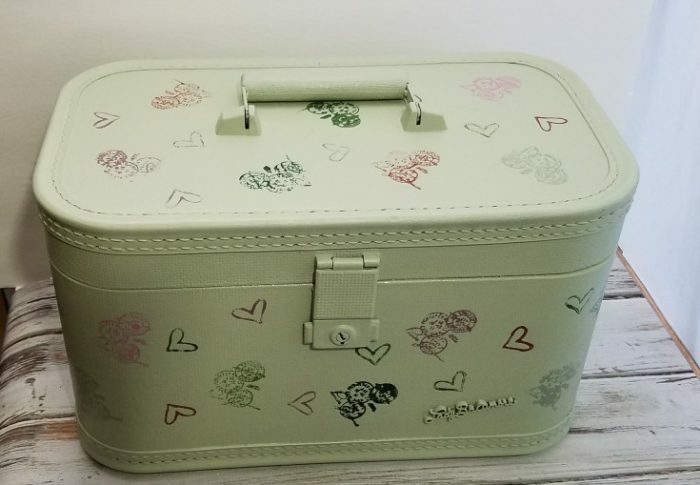 And the outside with the addition of the stamps is also very pretty and in keeping with the theme Great idea, now I want to redo my girls case. Thanks Mary! 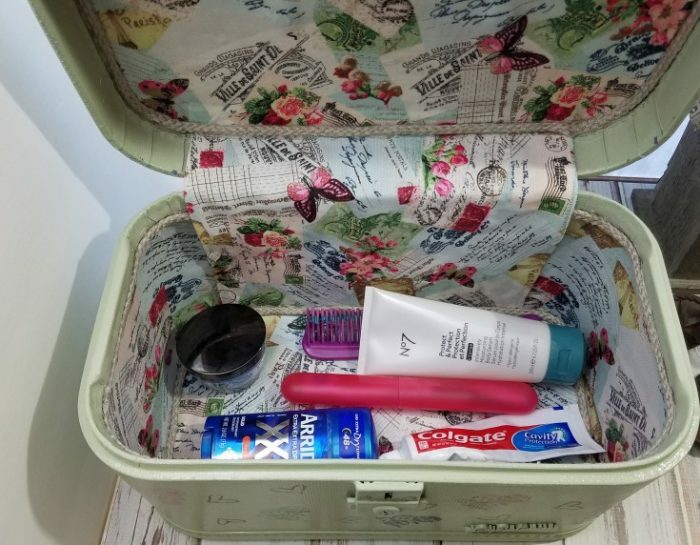 I had always just thought that it was a cosmetic case or toiletry case as well. Thats what my mother used it as. Oh this is fantastic Linda, I love both, the inside and outside! The fabric is perfect for this. 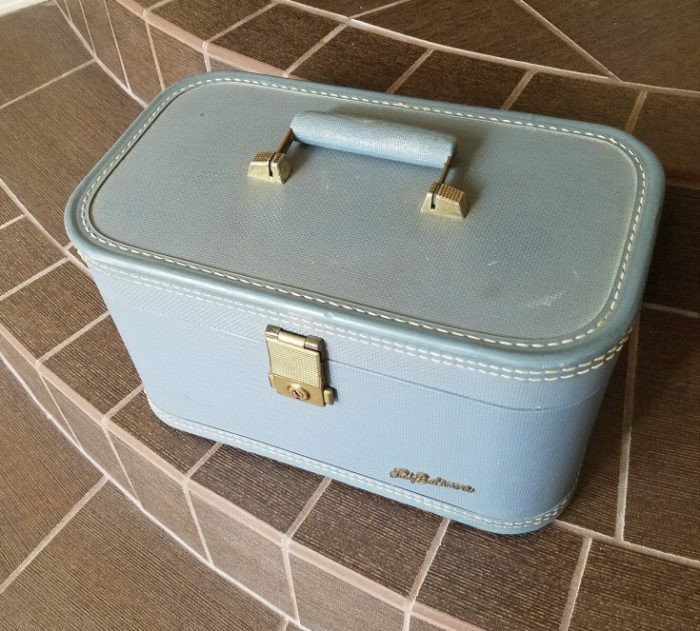 I have never made over a vintage suitcase, wish I´d find one. Thank you Katrin! It was a pretty easy makeover. I think the hardest part was what to do with the outside since my first plan wasn’t going to work. I knew all along that I wanted something to do with travel, and I thought the fabric was a perfect choice as well. It was a lot easier to redo than I thought that it would be. I would love to see you work your magic on one. I haven’t any doubt it will be amazing!!! Oh, I love this! I snitched a train case from my MIL when they downsized, and lined it with fabric. This was in the 80s so guess which colors I used. Yes, green and rose floral. I still have it standing open in my guest room filled with cosmetics guests might have forgotten, and water bottles, etc. I always think I’ll take it on a trip one of these times. Thank you Dorothy! I know exactly the colors, and floral you are referring to. When we bought our house a few years back our whole house was those colors. I think it would be so pretty on a train case, but not throughout a house. I think that is a great idea for a guest room. Now I need to find another to makeover to match in with the guest room. Thanks so much for stopping by! Oh, this looks great! I love train cases. My mom had one that she used for years and years, and I’d love to have one of my own. I adore the fabric you used on the inside. The whole thing is just perfect. Thanks Missy! Thats so neat that your mother saved old postcards in the case. I bet its fun looking back through them and remembering the good times. Now you will have to give your ugly blue case a new makeover, so you will have something pretty to store those fun memories in. Be sure to share when you get done. Thanks so much for stopping by! Thank you Gigi! When I found that fabric pattern I knew this was the one.